Justine works on the marketing team managing online campaigns, providing research, communications strategy and content development for clients and Industrial Brand. An experienced social media marketing strategist, Justine helps maximize online engagement through socmed channels for IB and its clients. 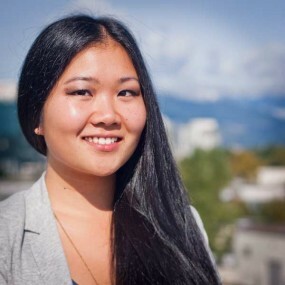 She is a graduate of Simon Fraser University with a Bachelors of Business Administration from the Beedie School of Business and a double major in Communications with a specialty in Marketing and New Media. Justine has experience in strategic marketing, promotions, public relations, and social media having previously worked for companies like Grey Vancouver, Warner Bros., and Invoke Media. Over the past few years she has done freelance work with clients like Olympian Bobsledder Justin Kripps, Switch United, and Republic Media to develop communications plans and social media strategies. When she’s not working you can usually find her in the kitchen whipping up some tasty creation, trying out one of the many new restaurants or breweries in town, drinking 3-shot lattes, or hiking with her four dogs.